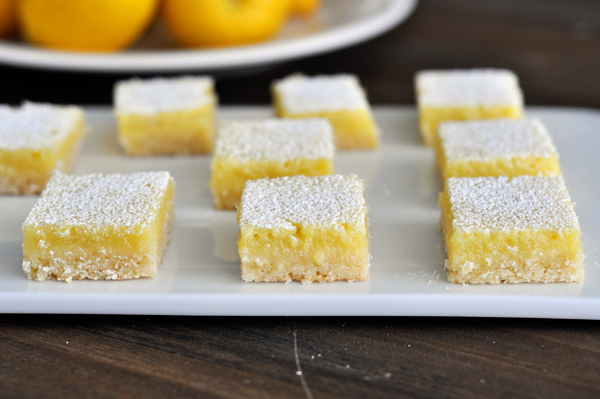 These lemon bars have a wonderfully substantial ratio of crust to filling. And while the lemon filling is perfectly and very robustly lemon, it doesnít overpower in a way that makes you think ìwow, Iím not going to be able to eat anything lemon for a week!î after tasting one. Place an oven rack in the middle position and preheat the oven to 350 degrees F. Line a 9X13-inch baking pan with foil or parchment paper and lightly grease the foil/parchment. Stir together the flour, powdered sugar, cornstarch, and salt (this can be done in a food processor or in a large bowl by hand). Add the pieces of butter and cut the butter into the dry ingredients using a pastry blender, two knives or your fingers or process in the food processor for 8 to 10 seconds and then as needed until the mixture resembles coarse meal. Sprinkle the mixture into the prepared pan and press into an even layer on the bottom and about 1/2-inch up the sides of the pan. Refrigerate for 15-30 minutes. Bake until golden brown, about 20 minutes. For the filling, whisk together the eggs, sugar, and flour in a medium bowl and then stir in the lemon zest, juice and milk to combine. Pour the filling onto the warm crust (it's important that the crust is still warm!) and reduce the oven temperature to 325 degrees. Bake for about 18-20 minutes until the filling feels slightly firm to the touch. Cool the bars to room temperature, sprinkle with additional powdered sugar and cut into bars.